Niacin/ Vitamin B3, is a water-soluble vitamin and is part of the B Complex. It is required for the metabolism of carbohydrates and protein into energy. Niacin supports cardiovascular health and promotes increased blood flow. 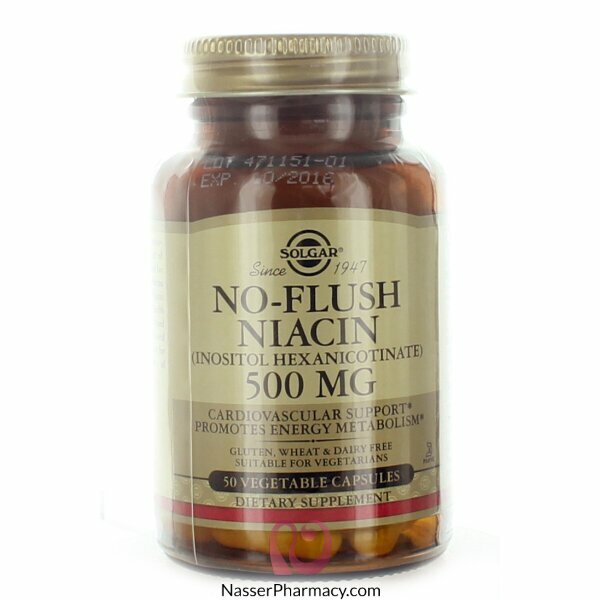 The unique, inositol-bound niacin in this formula allows for a gentle, no-flush delivery of niacin to the body. As a dietary supplement for adults, take one (1) to two (2) vegetable capsules daily, preferably at mealtime, or as directed by healthcare practitioner. Vegetable cellulose, silica, vegetable magnesium stearate. Free of : gluten, wheat, dairy, soy, yeast, sugar, sodium, artificial flavor, sweetener, sugar, sodium, artificial flavor, sweetener, preservatives and color. L-Carnitine is a dipeptide made up of two other essential amino acids: L-Methionine and L-Lysine. It.. Description:Produced with our finest Moroccan Argan Oil, this sumptuous but light hair treatment is .. Description:A hydrating vegetable soap bar based on Organic Vitamin E and enriched with Safflower. T..